I make no apology for my love of the humble lemon, whether it is part of ice and a slice in a large G&T, or an early morning detox in boiled water, I do not like to be without my lemons! But how often do we, with the best of intentions, grab a bunch of these most attractive little citrus bombs, absolutely exploding with vitamins, only to use one and leave the rest to slowly die in the fruit bowl, underneath the rather bossy pink lady apples and juicy seductive peaches. No more! I wish to stop this abhorrent ill treatment of lemons, and so Dear reader, for your perusal I am giving you ten uses for the underdog of the fruit bowl. 1. Lemons can help prevent kidney stones. lemon juice taken daily may increase production of urinary citrate, a chemical in urine that prevents the formation of crystals that may build up and form kidney stones. Simply squeeze half a lemon into a cup of boiled water first thing on a morning, this is also an excellent aid to weight loss, bonus! it really is an excellent daily habit as it flushes the system. 2. Lemons are anti ageing. Huzzah! I know. Lemons reduce production of free radicals, which are responsible for ageing skin.Also applied neat to age spots in can lighten them,just dab a little juice on and leave for fifteen minutes,before rinsing. 3. Lemons are great to clean and whiten nails. Squeeze half a lemon into a cup of warm water, then soak your fingertips for around five minutes. Viola! 4. Lemons are the best for chills and fevers. Squeeze a lemon into boiled water, add a little grated ginger, Spanish Doctors swear by it. 5. 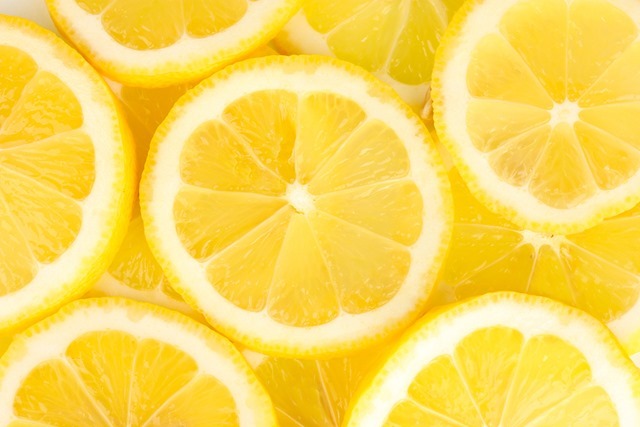 Lemons will freshen your fridge. Chop a lemon into quarters and leave on a saucer overnight in your fridge, it will absorb all yukky smells and leave it fresh and lovely. 6.Lemons will stop rice from sticking. Yep,just a quick squeeze in the pan will avoid a horrid gloopy congealed mess. 7. Lemons are great on stains. I know this from my vintage days, it was great on old tablecloths with age marks and such,Cut a lemon in half, sprinkle with salt and rub on the stain, leave in natural sunlight if you can for a while, repeat if necessary until stain is gone. 8. Lemons make an amazing skin toner. Add a shot of fresh lemon juice to 6oz of distilled water and 3 drops of tea tree oil, either put in a spray bottle for a quick spritz or apply with cotton pads.Keep in the fridge. 9. Lemons whiten your teeth. mix freshly squeezed lemon juice with a little baking soda, mix until it bubbles, apply to teeth with a cotton bud, leave for a minute before brushing as normal. 10. Finally…. make a lemon cake! This is my Mothers secret recipe. You are welcome. 4oz unsalted butter, 6oz caster sugar creamed. Add; 2 large eggs, 4 tbsp milk, 6oz flour, grated rind of one lemon. Mix well to a soft dropping consistency, pour into a lightly greased loaf tin and bake in oven (350/gas 4) for around 30-40 mins, keep checking obvs. Mix 3 rounded tablespoons of icing sugar with 5 tablespoons of lemon juice, when cake comes out of oven drizzle over.Leave in tin until completely cold.